Buy Free Cheese Comix a Coffee. ko-fi.com/freecheesecomix - Ko-fi ❤️ Where creators get paid by fans, with a 'Buy Me a Coffee' button. After a decade of cartooning in various forms, I wanted to try my hand at a non-sequitur comic. I wanted the comics to be accessible, relatable, funny, inclusive, and easy to produce. I knew that I wanted these comics to be as inclusive as possible so that no one who viewed them felt left out based on gender, age, orientation, background or education. All without sacrificing quality, relying on running gags, inside jokes, self-deprecation, or fart jokes (which I find hilarious but still). From past experience, I knew that real life could take its toll on any production schedule. And that feeling pressured to be inspired, funny or creative often stifles the very output you want to create. I also knew that I was not the most talented artist, so I needed an art style that I was able to focus on without worrying about self-critic syndrome. These are those comix. Welcome to my Ko-fi Page. I made this page because it takes a lot of caffeine to stick to a schedule and also be funny. If you enjoy my comix, please consider supporting what I do. Thanks in advance! Secured Payments. Support goes to Free Cheese Comix's account. 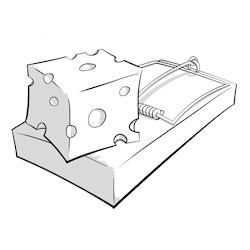 Upgrade Free Cheese Comix to a yearly Gold Membership with a one-time payment.